Neil Martin (1885-1963) was brought up in Laredo, Texas. The Galveston hurricane of 1900 devastated his family and caused him to take up life as a sailor, before an accident made him leave the sea. By the late 1920s, he was out of work and looking for a way to earn a living. At the time of the Great Depression, there wasn't much work for him to do. Luckily for him, he was a good storyteller and had sold a couple of stories to Top Notch (published by Street and Smith) and Danger Trails (published by William Clayton). He started off on a writing career then, writing sea stories and westerns for magazines like Sea Stories and Five Novels Monthly. This phase of his career lasted till the early 1940s, when he shifted markets to Short Stories magazine, edited by Dorothy McIlwraith. He started writing exclusively for Short Stories, and his series of stories about Henry Pou, a Cajun lawman in Louisiana, was a hit with readers. Three of his stories were given cover illustrations as well. His pulp writing career ended when the pulps declined in the 1950s. He passed away in 1963. This collection features four pieces from the magazine, Five Novels Monthly and one from Short Stories. It seems to have been put together by a descendant, William Neil Martin (possibly a grandson). It has an introduction with some biographical information, but no photo of the author. The four pieces from Five Novels Monthly are: Forbidden Seas from December 1931, Eastward Passage from September 1933, Thunder Over the Mast from March 1938 and Shanghaied! from January 1939. I enjoyed them all, though the romantic element felt a little out of place and formulaic. In each, the hero falls in love with the heroine whom he rescues, but hardly any words are exchanged between them. I have not read any other stories from Five Novels Monthly, so I don't know if this was a general feature of all stories in that magazine. Forbidden Seas is a long story of a quest for a fortune in mammoth ivory hidden on a Russian island before the Russian Revolution. Three people are after the ivory, a rogue trader who has managed to suborn a Russian gunboat commander to give him exclusive trading rights, our hero and the heroine who is the daughter of the man who cached the ivory. Eastward Passage is the story of a couple of thieves after a pair of legendary pearls called the Twin Moons, being carried by a trader. They pursue them through a shipwreck and a mutiny. Thunder before the mast starts with a sick man being brought aboard a cargo ship by his sister. Before she can get back, the crew, led by a pair of thieves, mutinies in an attempt to steal the cargo of gold that the ship is carrying. The mutineers need the captain to sail the ship, and uses the heroine to blackmail him. There's a storm on the way, and the captain uses that to his advantage. 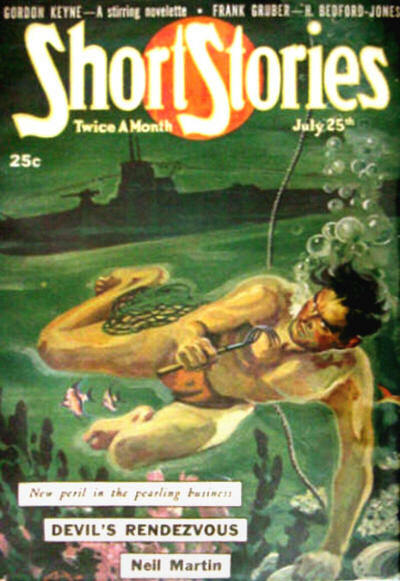 First Command, (Short Stories, 25 May 1940), has the hero against two adversaries, an unknown person sabotaging the ship he's sailing on, and the captain of the ship, who is trying to sabotage his career and his love life. An enjoyable read overall. The stories are well written, and the heroes think instead of merely punching or shooting their way out. You can get the paperback or the ebook. 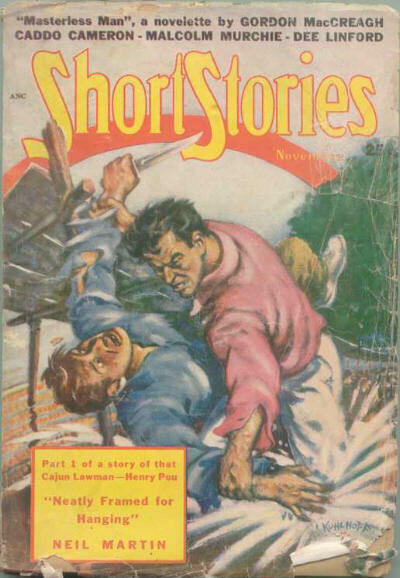 I highly recommend the Henry Pou stories from SHORT STORIES in the 1940's. There were about a dozen, all long novelets starring Henry as a sheriff down south. Very good mysteries with excellent atmosphere and characterization. There was an article praising the series in an early issue of BLOOD n THUNDER. 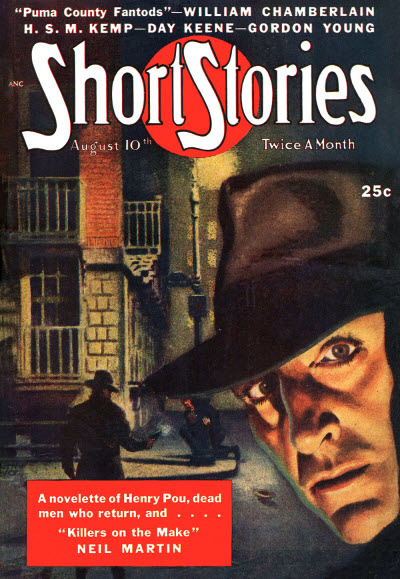 In fact, I would say that the Henry Pou stories are among the very best fiction published in SHORT STORIES during the forties. Walker, if you have the BnT issue that has the article about the Henry Pou stories, can you share a list? I see that I misplaced the issue with the article but it's Blood n Thunder #18, the Summer 2007 date. I also believe the article was reprinted in the Best of Blood n Thunder, Volume two, All the novelettes appeared in the 1940's in SHORT STORIES and I think there were 10 of them. Neatly Framed for Hanging (sl) Short Stories Nov 1949, etc. I checked my issues for Neatly Framed for Hanging and it's a two part serial that appeared in November and December 1949. It's one of the few Henry Pou stories that I haven't read yet, so I have something to look forward to.